* Pressure cooks the dal with the water, salt, chilies and turmeric well mixed in it. It took nearly 12-15 minutes for pressure cooker to boil. 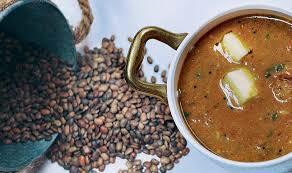 * Meanwhile grind together the mustard seeds, cumin seeds, garlic into a paste merged with few teaspoons water. * Heat the oil. Fry the sliced onions till they are golden brown. Now add the paste and fry a few more seconds, rousing constantly. * Add the tomatoes. Fry till the fat separates. * Strain the tamarind water and push through a strainer as much of the pulp as you can. Discard the seeds. Add the tamarind to the pan. Let it come to a boil. Simmer a few minutes before turning into the dal. Stir it well. Now the dish is ready to eat. Kumaon Hills Dal is ready to eat. Serve this dish while it is hot. It takes approx. 30 minutes for cooking of this dish. This dish is enough for 6 peoples.